"Nazi Cops" and Hate Groups: More Lies From the Left — Condition Yellow: Stay Alert. Stay Alive. Just yesterday, we analyzed and dismantled a piece released by shameless leftist writer Angela Bronner-Helm for similarly-leftist media outlet The Root, in which she demonized law enforcement without evidence. Just one day later, Helm is back at it again. For any significant change to American policing to occur, we have to upend police unions, which wield extraordinary power and influence. Helm points out something leftists hate to admit — union corruption is one of the most pervasive problems facing America's workforce. Of course, because police unions generally don't throw millions at Democratic causes, they don't qualify for the same leftist protections. Therefore, any benefits police enjoy as a result of unionization must be shut down. Oh no! McNesby is a Nazi sympathizer! Or is he? 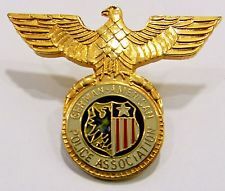 The police officer Helm claims to have "Nazi tattoos" is Ian Hans Lichtermann, who has an eagle inscribed on his left forearm, centered under the word "Fatherland." Clearly, Officer Lichtermann is a Nazi sympathizer, right? Well, no. HuffPost Black Voices reports that the officer in that case, Ryan Pownall, fatally shot David Jones, who ran from a traffic stop on June 8. This marks the second time Pownall has shot a black man in the back as he was fleeing. In 2010, he shot Carnell Williams-Carney who ran from cops while having an illegal gun on him. “While I fully support lawful protests as provided by the First Amendment, yesterday’s events were not that. Instead, Black Lives Matter activists invaded a residential neighborhood without a permit, utilized bullhorns to spew profanity, and threatened an endless occupation of that neighborhood until their demands are met. This same unlawful protest also required a contingent of police officers who would otherwise be working to preserve safety across our city to instead protect the residents of this neighborhood, including the officer and his family. Again, there is zero evidence Officer Lichtermann is a Nazi. And while yes, Officer Pownall did shoot two people in the back, that's generally what happens when you pull a gun on a police officer. But by all means, Helm, keep writing this garbage — we'll keep exposing the lies. Sep 5 Gun-Wielding Felon is Killed by Police. His Family and Friends Absolve Him of Any Wrong-Doing. Aug 7 An Ex-Cop's Proposal for "Civilian Led Policing" is Making the Rounds. Here's Why It's Stupid.